Then there is Hungary’s government-funded poster campaign depicting opposition parties and NGOs as puppets of Jewish billionaire George Soros; Poland’s evisceration of judicial independence and the presidential veto that stopped it. Plus Venezuela’s constituent assembly poll, boycotted by more than half the population amid incipient civil war. Overshadowing all this is a three-cornered US constitutional face-off between Trump (accused of links with Russia), his attorney general (who barred himself from investigating the Russian links) and the special prosecutor who is investigating Trump, whom Trump is trying to sack. Another popular technique is the micromanaged enforcement of non-dissent. 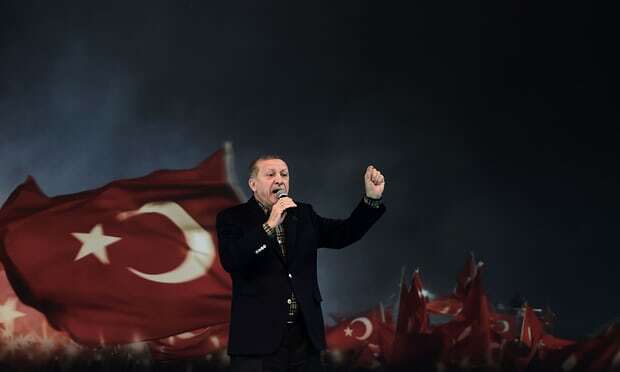 Erdoğan not only sacked tens of thousands of dissenting academics, and jailed some, but removed their social security rights, revoked their rights to teach, and in some cases to travel. Trump is engaged in a similar micromanagerial attack on so called “sanctuary cities”. About 300 US local governments have pledged – entirely legally – not to collaborate with the federal immigration agency ICE. Last week the US attorney general Jeff Sessions threatened federal grants to these cities’ local justice systems, a move Trump hailed using yet another fashionable technique – the unverified claim. Trump told a rally of supporters in Ohio that the federal government was in fact “liberating” American cities from immigrant crime gangs. They “take a young, beautiful girl, 16, 15 and others and they slice them and dice them with a knife because they want them to go through excruciating pain before they die”, he said. At school – and I mean primary school – we were taught to greet such claims about racial minorities with the question: “Really? When and where did this happen?” Trump cited no evidence – though the US press managed to find examples in which gang members had indeed hacked each other. This repertoire of autocratic rule is of course not new; what makes it novel is its concerted and combined use by elected rulers – Putin, Erdoğan, Orbán, Trump, Maduro, Duterte in the Philippines and Modi in India – who are quite clearly engaged in a rapid, purposive and common project to hollow out democracy. Equally striking is that, right now, there is no major country prepared to set positive global standards for democracy. In her 2015 book, Undoing the Demos, UC Berkeley political science professor Wendy Brown made a convincing case that the world’s backsliding on democratic values has been driven by its adoption of neoliberal economics. It is not, argues Brown, that freemarket elites purposely embrace the project of autocracy, but that the economic microstructures created in the last 30 years “transmogrify every human domain and endeavour, including humans themselves, according to a specific image of the economic”. All action is judged as if it has an economic outcome: free speech, education, political participation. We learn implicitly to weigh what should be principles as if they were commodities. We ask: is it “worth” allowing some cities to protect illegal migrants? What is the economic downside of sacking tens of thousands of academics and dictating what they can research? In his influential 2010 testament, Indignez-Vous (Time for Outrage! ), the French resistance fighter Stéphane Hessel urged the rising generation of social justice activists to remember the fight he and others had put up during the drafting of the 1948 Universal Declaration of Human Rights. They fought for the word universal (not “international” as proposed by the main governments) in the full knowledge that arguments about sovereignty would sooner or later be advanced to deny the rights they thought they had secured. It seemed odd, back then, even to those of us sympathetic to Hessel, to receive this long, repetitive lecture about the concept of universality. But he was prescient. The tragedy today is that there is not a single democratic government on Earth prepared to defend that principle. Sure, they will issue notes of displeasure over the death of Liu Xiaobo or Maduro’s crackdown. But they refuse to restate the universality of the principles these actions violate. The fight for universal principles has to begin – as Hessel recognised – with individual people. We must keep restating to ourselves and those around us that our human rights are, as the 1948 declaration states, “equal and inalienable”. That means if one faraway kleptocrat steals them from his subjects, that is like stealing them from ourselves. Every democratic advance in history, from the English revolution of 1642 to the fall of Soviet communism in 1989, began when people understood the concept of rights they were born with, not to be granted or withdrawn. Today that means learning to think like a free human being, not an economic subject.